During an emergency, there are a variety of situations that may limit communication. 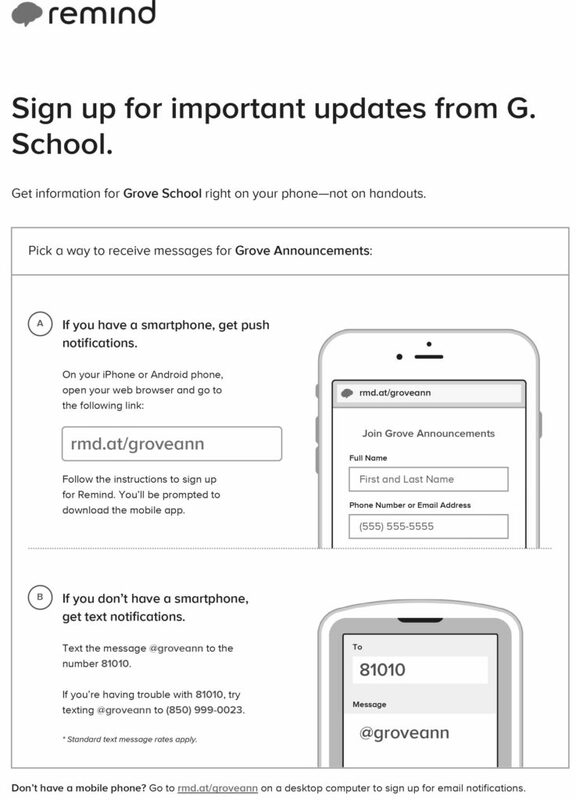 In an effort to mitigate that effect, all families should register to receive Grove School text alerts through the Remind app to receive more immediate information and direction in case of emergency. On a smartphone, use the browser to go to rmd.at/groveann. Then, follow directions to register your device. number 81010. If you’re having trouble with 81010, try texting @groveann to (850) 999-0023. Throughout the year, drills and conversations are held with all staff, faculty, and students in preparation for an emergency. Families, students, and the Grove School all have a role in making sure that all students are accounted for and keeping everyone safe. only PICK UP their son or daughter when the school has determined the campus is safe and has given communication on directions for release to families. We all, of course, hope that we never have to put these procedures in place, but understanding our roles to cooperatively keep students safe, we can better prepare for that possibility.